Therefore, you must proceed to unlock the Drive Image using the “manage-bde” command line utility. Typing, for example, the command: “manage-bde -unlock D: -RecoveryPassword <recovery-key>”, the drive will be unlocked (see images below). 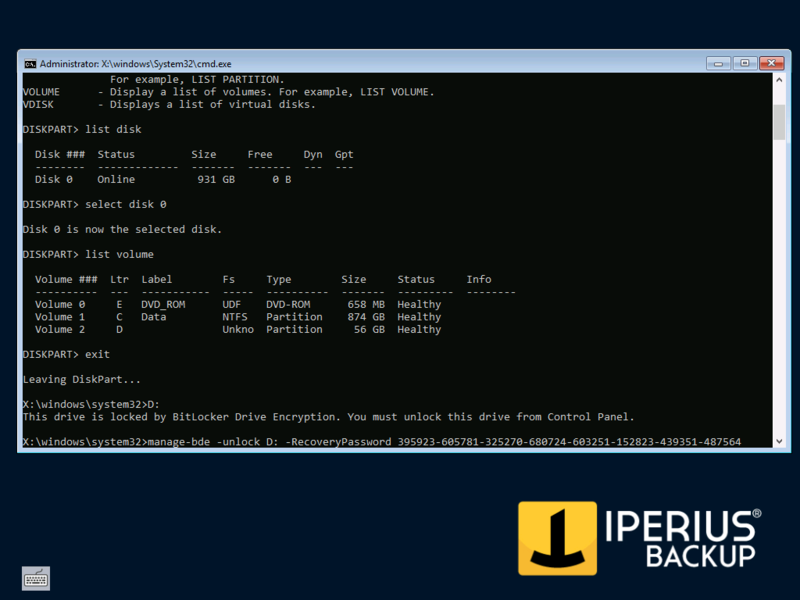 Once BitLocker protection is removed from the volume, it will be possible to proceed with the recovery operations as indicated in the article Restore a Drive Image Backup (system recovery) with Iperius. Enabling disk protection with BitLocker allows you to have high protection for your data. It is therefore essential, especially in environments where security is a critical factor, to have backup software such as Iperius, which is perfectly compatible with BitLocker encryption. Making a backup of a BitLocker encrypted drive is a completely transparent operation with Iperius, and allows you to have perfectly protected backups and comply with the most recent provisions of the GDPR regulation, which requires the encryption of sensitive data in many areas.